Creating and publishing content is often a collaborative exercise, and Atlas makes it easy to work together on a project, track everyone's changes, and incorporate those changes into a master set of project files. Here is an overview of how you can use Atlas to leave behind Word file wrangling for good. Choose the appropriate collaborator type from the drop-down, and then click Invite. Repeat for each user you’d like to add. If an invitee is already an Atlas user, she will immediately be granted access to the project and see it on her Projects dashboard. If she is not yet an Atlas user, Atlas will send her an email asking her to sign up, and once she does so, she will see the project on her Projects dashboard. 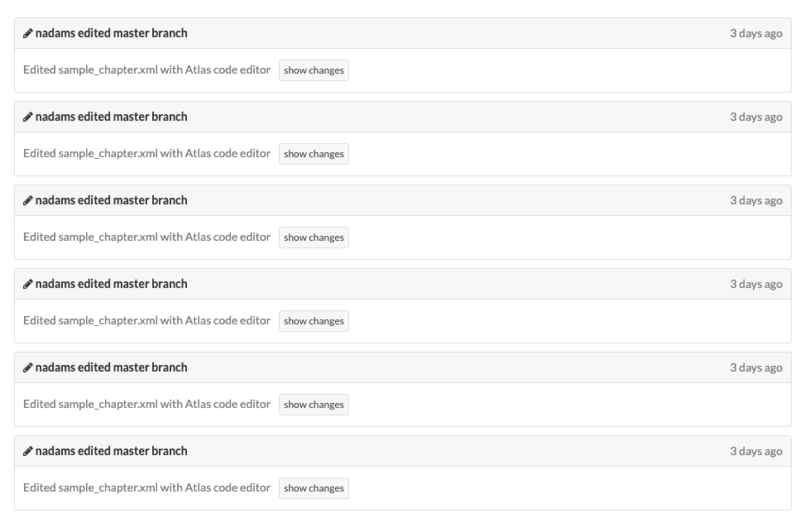 Branches are an important and powerful feature of the Atlas collaboration suite, as they allow users to work independently and concurrently without worrying about disrupting others' work or introducing file conflicts. In Atlas, the master set of files is stored on the master branch of the project. This is usually the canonical version of the project. If a user wants to edit the project content, he should click "Add a branch" to create his own branch—a personal copy of all the files in the project. When he has completed his work, he'll submit the edits he has made on his branch to a project owner, who reviews the changes and decides which ones to merge back into the master branch to become part of the master file set. Figure 6-1. Note the unlocked icon in the upper left corner. Figure 6-2. Note the locked icon in the upper left corner. You'll need to make your own branch to edit the project files, as described in the following section. Even if you can't edit master, you can always view it for reference. After creating a branch, you are free to make any kind of change, including adding or deleting files, fixing typos, adding new images, or inserting comments. You can compare the modified files in your branch against the files in the master branch by clicking on "Compare," which is right under the "Send Edits to Master" button. If you're satisfied with the changes you've made, you can then send the edits to master so that the project owner can review them. The following two sections cover each of these steps. In this screenshot, you see the changes in your branch compared against master. Text that you've deleted is highlighted with a red background, and text you've added is highlighted with a green background. Here, the text "Is" has been changed to "is", and the text "Heading" to "heading." The asterisk icons indicate changes that can't be displayed visually, such as new lines or returns. You can switch to the Code Editor to see details on the markup changes that have been made here. Once you're happy with the changes you've made, you're ready to send them to the project owner for review. If you send changes to master for review, be aware that the entire branch is sent, not just specific files. The Owner of the master branch will see and review all of the changes that you've made in every file in your branch—so organize your workflow accordingly. You can also send changes to master for review from the project dashboard by clicking the "Send Edits to Master" button. This will take you to the Compare tab, where you can fill out the "Send Changes to Master" dialog and submit as described above. 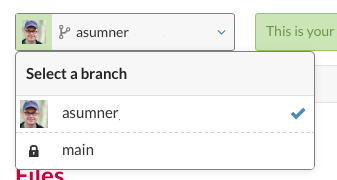 Note that after you submit your changes to the master branch, your branch will no longer be available. To make more changes, create another new branch! In the above example, there are two review requests (both from the same Collaborator). To review a set of changes, click on the corresponding "Review changes" button. As in the Compare view described in the previous section, deleted words are shown in red, additions are in green, and changes that can't be shown visually are indicated with asterisk icons (again, for more details on the markup changes flagged by these icons, switch to the code view). Note the up and down arrow buttons, and the Accept and Reject buttons to the right. To navigate sequentially through the edits in the document, use the arrow buttons; the up arrow takes you to the previous edit, and the down arrow takes you to the next edit. The edit you're currently reviewing will be highlighted in bright red/green. To accept this edit, click the Accept button. Alternatively, to reject the edit, click the Reject button. If you'd like to make additional changes to the document while accepting and rejecting changes, you can also edit the text in the document directly, just as you can when working in the standard edit mode. To save time, you can also decide to accept or reject all outstanding edits in a given document at once by clicking either the "Accept All" or Reject All" links below the Accept/Reject buttons. Click this button to merge the changes you've approved, as well as any other edits you've made during the review process, into the master branch, and make them part of the master file set. Once you begin accepting and rejecting items in a particular merge request, you must complete the review and click "Save & Finish" or cancel. Partial progress on the review screen is not saved if you navigate away from the review page without clicking "Save & Finish." Don't be! Atlas uses a set of revolutionary algorithms that work to avoid merge conflicts altogether, so don't hesitate to invite as many people to your project as you need. And if the tool can't reconcile the changes automatically, you'll get a warning letting you know what's going on. That way, you can take the appropriate action and not worry about things falling through the cracks. Sometimes you just want to ask your fellow collaborators a question rather than making a text change, or maybe you're a copyeditor that wants an author to include more detail; Atlas comments are a great way to do it. To insert a comment, simply click the button in the toolbar. Collaborators can leave comments in their own branch, and they'll get sent to an owner in a merge request. If you're an owner, you can leave comments in anyone's branch or directly in master. To remove a comment, just click the "x". On the right, you'll find a list of recent builds, who initiated them, and when. You can also download the output formats directly from here, or view the build log for each build. The left-hand pane displays when collaborators have made changes, which files were changed, and in which branch. You'll also see when merge requests are made and when they are reviewed and accepted into master. This information can help you keep track of what others are working on, and when various documents were last edited. Atlas's collaboration tools work best when paired with effective communication and organization among collaborators on a project. Below you'll find some suggestions, tips, and tricks from the Atlas team to help you create and manage a successful workflow for your Atlas projects. Avoid reviewing and merging more than one collaborator submission at a time. While projects may have multiple owners, designating one person at a time to review submissions and merge them into master will streamline your workflow and prevent wasted time resulting from multiple people reviewing the same submission concurrently. Coordinate who is working on which documents within a project at a given time. The more people working on the same document at once, the more difficult review can become for the project owner. Use the Activity log to help keep track of who is doing what to reduce user headaches! Opt for multiple smaller submissions rather than fewer large submissions when possible. Along with descriptive messages, submitting changes for review in smaller chunks allows the master file set to be updated more frequently, keeps other collaborators up to date, and reduces the chance of multiple collaborators making contradictory changes. Swap to the code view as needed when on the Compare or Review screens. Not all changes can be represented in the visual view; some things, like underlying markup/formatting changes, are represented in the visual view by an asterisk icon. Just as in the editing environment, you can switch to the code view to view changes that would otherwise be hidden in the visual editor. 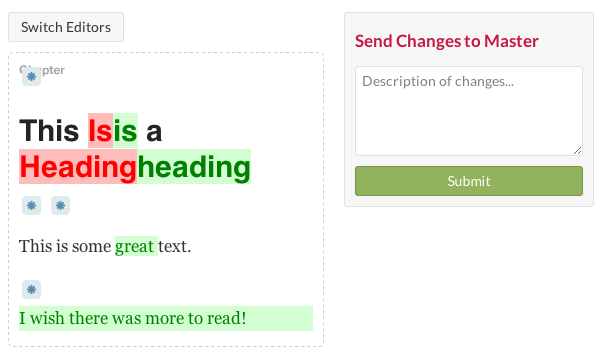 Add a descriptive message when submitting your changes for review. While these notes are optional, it's useful to keep track of the kind of work contained in each submission to master. It helps eliminate confusion and increases efficiency when merging. Work directly in master when appropriate. Are you starting a new project by yourself, or are you the only owner on a project? You can save time by working directly in the master branch. Atlas will still keep the full history of your work and display updates in the Activity log when you make changes. Use "Accept All" or "Reject All." These features are available on the Review screen and can be used to save time if you're sure you want to accept or reject all of the changes in a given document. Make additional edits while reviewing. Reviewing someone else's changes and notice an additional error? You can place your cursor in the Review window and edit directly. If the section you'd like to change is already highlighted, you must accept or reject the change first, and then you can make additional adjustments. Ask collaborators to set up an avatar. This makes it easy to identify at a glance who has created which builds, left text comments, etc. Set this up from your account settings page. Atlas uses Gravatar, so if you already have an account under your Atlas account email address, you're already done.